Following the publication of casualty figures for the conflicts in Syria, Ukraine and Gaza this summer, we look into the origins of these numbers and what they tell us. In the all-too-frequently occurring context of armed conflict, casualty figures can be key to galvanising public opinion and the international community, often providing a baseline for decisions on the policy course that will be adopted. This summer was no exception to the rule, with the press and other media full of casualty numbers regarding the conflicts in Gaza, Ukraine and Syria. We analyse these numbers to provide some clarity on their origin, and an understanding of how much can be known about them at present. 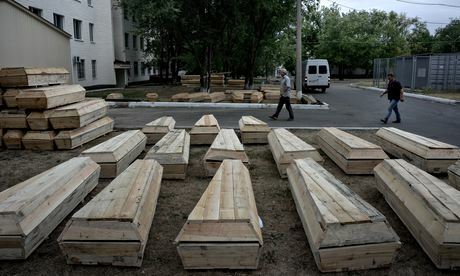 Coffins prepared for burial outside the morgue in Luhansk. Photo: Maria Turchenkova for The Guardian, Despair in Luhansk as residents count the dead, 11 Sep 2014. The figure which has been circulated of 191,369 casualties for the period of March 2011 until April 2014 was published by the UN’s Office of the High Commissioner for Human Rights (OHCHR). OHCHR is however only the sponsor of this number. The actual figure comes from an NGO specialising in the statistical analysis of human rights violation records: the Human Rights Data Analysis Group (HRDAG). HRDAG did not document casualties or collect data itself in this instance: it worked from datasets which were provided to them by Syrian civil society casualty recorders. Several such organisations undertake casualty recording activity in Syria, some of whom were described in an earlier Every Casualty (EC) article, and whose work provided the basis for an Every Casualty report on the child victims of the war. HRDAG has been producing the casualty figures which have been shared by OHCHR on this conflict, but the datasets from which HRDAG extracted these figures have not remained consistent. This latest number was arrived at with the contribution of data from the Syrian Centre for Statistics and Research (CSR-SY), the Syrian Network for Human Rights (SNHR), and the Violations Documentation Centre (VDC), all of whom provided information in HRDAG’s past reports for OHCHR. However the Syrian Observatory for Human Rights (SOHR), which had contributed to earlier enumerations produced by HRDAG, refused to share its data on this occasion, and the Syrian Arab Republic Government, whose data had also contributed to earlier reports, stopped providing data after early 2012. So for this enumeration HRDAG was only able to include already-existing data from the Syrian Arab Republic Government for the period March 2011-March 2012 and from SOHR for the period March 2011-April 2013, updated with data solely from CSR-SY, SNHR, and VDC for the period from March 2011 to April 2014. HRDAG began with 318,910 casualty records (meaning fully identified victims) from its five datasets. Its subsequent work essentially consisted of identifying duplicates and removing them from the list. This was done largely by computerised algorithmic means supplemented by human expertise (three native Arabic speaking experts reviewed the records with the original Arabic content). 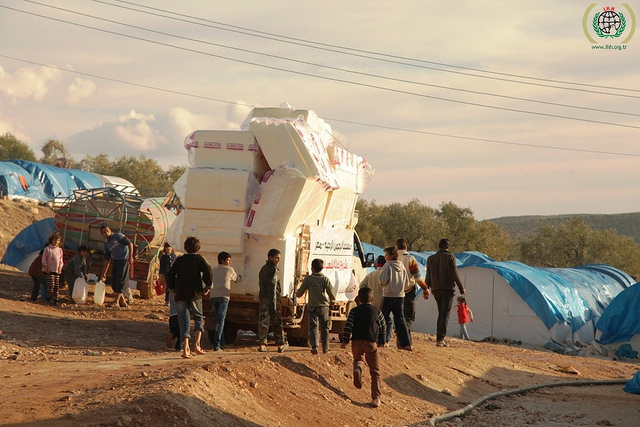 The final number arrived at was the one published by OHCHR in August this year: 191,369. HRDAG notes in its report that this enumeration may be an underestimation of the actual number of casualties on the ground. HRDAG’s report for OHCHR states that it is their belief that this count is by no means inclusive of all actual deaths as many more killings remain undocumented for the time-being. The figure communicated for the conflict in Ukraine quotes civilian casualties at around 2,200. This number is again published by OHCHR. It is important to realise that HRMMU primarily records human rights violations. This means that violent deaths resulting from the conflict, when witnessed, will also be recorded but without this being the main intent. HRMMU thus constitutes a major source of information for OHCHR’s casualty figure, but it is not the only one. In its report, OHCHR lists the World Health Organisation (WHO) and civil medical establishments as other contributing sources for their estimate, in addition to HRMMU data. It may also be noted that OHCHR describes the total figures it has published as a “conservative estimate”, and the supporting material published by OHCHR describing its methods does not indicate whether all the casualties have been documented at the level of identified individuals, particularly where data from sources other than HRMMU are concerned. It would seem that in any case the data which OHCHR is working from in Ukraine is not as detailed as a list of identified victims (unlike in the case of Gaza and Syria). Every Casualty is unaware of any civil society organisation which identifies itself as carrying out systematic casualty recording activity at present in Ukraine. A recent article published on this website discusses the casualty figures that have been presented for the Gaza conflict and can be found here. What we can add in the present context is that the multi-agency documentation in Gaza, and the figures which derive from this documentation, are among the most detailed and comprehensive for any modern conflict. What is clear is that these numbers have all been produced by different methods, which means (among other things) that they cannot be directly compared. However, this has not prevented the international community and the public from treating them in the same way, presumably because all are taken at face value without examining their origins too closely. Such a lack of understanding and information can only hamper public discussion and political responses to these crises. As with other kinds of actionable data, understanding where casualty information comes from, and what limitations and caveats must apply to widely asserted figures, is vital for fully informed policy and operational decision-making. More generally, the power of casualty figures to influence public and political opinion requires that data collection efforts and databases answer to the principles of transparency, accuracy, and impartiality. This is what Every Casualty is calling for through its Campaign, and this is what we are working towards through our consultative standardisation process, which brings together casualty recorders and the wide constituency of casualty data users to develop, agree and promote standards for casualty recording.